We offer overnight (hotel) accommodation at Well House Manor - and we take pride in providing high quality rooms for business and leisure guests who are visiting Melksham. Many of our visitors "vote with their feet" and come back to stay the next time they're in the area. And many become our ambassadors, recommending us to their friends ... great news, since such recommendations are very honest - they bring in people for whom our facilities are just right. But, of course, we need to find new people / new blood in the first place - we need to reach the many, many people who'll be coming to Wiltshire without the benefit of advise from people who have visited before. How do we reach those people? Ten years ago, and / or for a conventional hotel, the automatic answer would have been to go for an AA or RAC listing, to advertise in Yellow Pages, and to buy space in various books and publications about the area. That's no longer an automatic answer as times have changed - indeed, in our particular case, we have decided NOT to spend money on a rating system which would involve investing the majority of a thousand pounds a year to get and maintain the formal certificates. As we've only got five rooms and good occupancy anyway which is growing, we felt that the extra costs would have to be recovered over relatively few extra bookings, or from our existing customer base who are clearly happy with what we offer - so they wouldn't be getting anything more for the extra five pounds per booking or whatever it was. But we have read the "how to apply for a listing" documents carefully, learned what they look for, and seen if and how the criteria apply to us; we are not averse to spending something to meet customer needs ... in fact we have lovely new chairs to announce in a forthcoming article. How do we reach people? Through our ambassadors. Through letting local businesses know were here. Through an internet presence for our computer training courses, for which people come from far and wide. 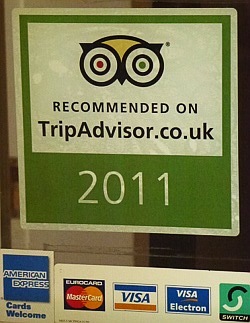 So it's a delight where our ambassadors rank us well on sites such as TripAdvisor ... "Well House Manor - a pleasure. As a long suffering user of hotels it was a great pleasure to find such a spacious well decorated hotel with immaculate facilities and very friendly staff. I would recommend this hotel to any one who wishes visit the Melskham area." Well House Manor - Business Hotel, Leisure Accommodation and Training Centre. Metrics ... have a look and see if what we offer is what you're looking for! * Five superb En-Suite rooms - all doubles / twins that we will happily let as singles. * Blisteringly fast internet access (wireless and wired, all rooms) and large workdesks with plenty of power points. * Public access computer, printing, copying and meeting rooms available. * Early and late arrivals and departures welcome (advance notice appreciated). * Single night stays welcome. * Single occupancy price £85.00 per night, double occupancy price £95.00 per night throughout the year (2012 prices). * Lower "contract" rate available for bookings of 10 nights or more. * Price includes superior continental breakfast; we use fresh local products wherever practical. * Plenty of free parking within our grounds, yet just five minutes walk from town centre. * Buses right outside to and from Bath; we can arrange pickups / lifts to / from Melksham station. * We can advise on other public transport and arrange airport and other station transfers. * All rooms no smoking, but we have sheltered smoking and seating available outside. * Open daily for snacks, cream teas, fresh coffees etc; drinks are complimentary for residents. * You are welcome to order in your evening meal from one of the many local restaurants that will deliver. * Online booking [here] - or book by phone to 01225 708225. * Well behaved dogs welcome with prior notice at weekends and holidays. * We are unable to accept residents under the age of 14. * We accept Visa, Mastercard and American Express without surcharge.